Superman Fan Podcast Episode 286: Superman Comic Book Cover Dated September 1962: Action Comics #292! ACTION COMICS 292, September 1962, was published around July 26, 1962. It contained 32 pages for the cover price of 12¢. The editor was Mort Weisinger, and the cover was pencilled by Curt Swan and inked by George Klein. – The 14 page Superman story was titled WHEN SUPERMAN DEFENDED HIS ARCH-ENEMY. No writer was credited, but the artist was Al Plastino. This story has been reprinted in SHOWCASE PRESENTS: SUPERMAN vol. III. – The 11 page Supergirl story was titled, THE SUPER-STEED OF STEEL, written by Leo Dorfman and drawn by Jim Mooney. This story has been reprinted in SHOWCASE PRESENTS: SUPERGIRL vol. II. Elsewhere in DC Comics, 28 titles carried the September or September/October 1962 cover date. Next Episode: SUPERMAN FAMILY COMIC BOOK COVER DATED NOVEMBER 1959 PART I: WORLD’S FINEST COMICS 105! In 2 Weeks: SUPERMAN FAMILY COMIC BOOK COVER DATED NOVEMBER 1959 PART II: SUPERMAN’S GIRL FRIEND LOIS LANE 13! In 3 Weeks: SUPERMAN COMIC BOOK COVER DATED OCTOBER 1962 PART I: SUPERMAN 156! In 1 Month: SUPERMAN COMIC BOOK COVER DATED OCTOBER 1962 PART II: ACTION COMICS 293! I also update the story of Al Plastino’s art for the SUPERMAN 170 story, SUPERMAN’S MISSION FOR PRESIDENT KENNEDY, which he had intended to be donated to the JFK Presidential Library, but instead recently surfaced for auction. Superman Homepage writer Adam Dechanel is the writer and co-director of a play that will be performed during the holiday season in London. Go to http://thejunglebook.eu/ for more information. A video trailer can be found here. – The SUPERMAN WEBRING of websites, and- The SUPERMAN PODCAST NETWORK at http://supermanpodcastnetwork ! The theme of this podcast is PLANS IN MOTION, composed by Kevin MacLeod, and part of the royalty free music library at http://incompetech.com/.Superman and all related characters are trademark and copyright DC Comics. Any art shown on this podcast is for entertainment purposes only, and not for profit. I make no claims of ownership of these images, nor do I earn any money from this podcast. Comic News Insider Episode 506 – CNI in Slasherland! Comic News Insider: Episode 506 is now available for free download! Click on the link or get it through iTunes! Sponsored by Dynamic Forces. Jimmy treks out to Brooklyn to the home of the Vampire Cowboys Theatre Company’s founders Abby and Qui for some pork tacos and fun times! He is joined by the director Robert Ross Parker and some of the cast (Tom Myers, Nicky Schmidlein, and Bonnie Sherman) of their current show Alice in Slasherland. The cast gives some details about the play and some fun tidbits about the characters they play. They also chat about the Britishisms Jimmy is finding while playing GTA V and discuss the new Captain America: The Winter Soldier trailer. News includes: Cartoon Network pulls Beware the Batman, Jamie Smart is shortlisted for Roald Dahl prize, Midtown Comics opens boutique in Times Square Toys “R” Us, Charmed may magically reappear on TV, and Al Plastino learns his Superman/JFK story is for sale. As always, listener feedback, Top 3 and more. Leave your iTunes comments! 5 stars and nothing but love! Superman Fan Podcast Episode 285 Part II: Superman Family Comic Book Cover Dated October 1959: Superman’s Pal Jimmy Olsen #40! Superman’s Pal Jimmy Olsen #40! SUPERMAN’S PAL JIMMY OLSEN 40, October 1959, was published around August 20, 1959. It contained 32 pages for the cover price of a dime. The editor was Mort Weisinger, and the cover was pencilled by Curt Swan and inked by Stan Kaye, featuring the issue’s first of three stories. All three 9 page stories were drawn by the same art team of penciller Curt Swan and inker John Forte, and have been reprinted in SHOWCASE PRESENTS: SUPERMAN vol. III. – THE INVISIBLE LIFE OF JIMMY OLSEN was written by Otto Binder. – JIMMY OLSEN, SUPERGIRL’S PAL was also written by Otto Binder, and reprinted in SHOWCASE PRESENTS: SUPERGIRL vol. I. – JIMMY OLSEN, JUVENILE DELINQUENT was written by Robert Bernstein. Also highlighted in this episode are the issue’s ads and other features, including the letter column JIMMY OLSEN’S PEN-PALS. Elsewhere in DC Comics, 32 titles carried the October or October/November 1959 cover date, thanks to the website MIKE’S AMAZING WORLD OF DC COMICS. These titles were highlighted at the end of Episode 198, for the week of Wednesday September 28, 2011. Next Episode: SUPERMAN COMIC BOOK COVER DATED SEPTEMBER 1962: ACTION COMICS 292! In 2 Weeks: SUPERMAN FAMILY COMIC BOOK COVER DATED NOVEMBER 1959 PART I: WORLD’S FINEST COMICS 105! In 3 Weeks: SUPERMAN FAMILY COMIC BOOK COVER DATED NOVEMBER 1959 PART II: SUPERMAN’S GIRL FRIEND LOIS LANE 13! Adam Dechanel, writer for the SUPERMAN HOMEPAGE, is also writer and co-producer of THE JUNGLE BOOK, a play that will be performed at The Lion & The Unicorn Theatre in London, England from December 13, 2013 through January 14, 2014. If you are going to be in Great Britain during this time, and would be interested in attending this play, call 08444-771-000. 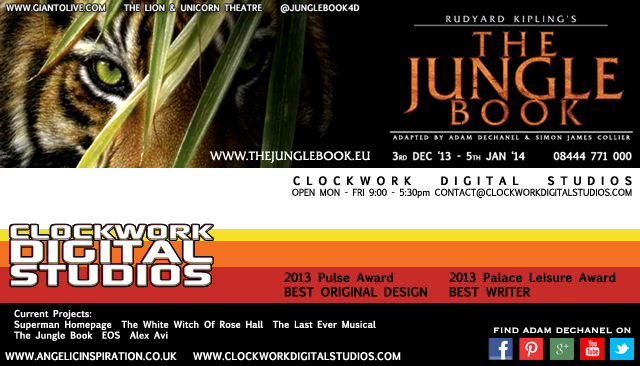 To learn more about the production go to http://www.thejunglebook.eu/. Finally, Al Plastino posted a picture of himself on facebook recently, holding his original art for the story, SUPERMAN’S MISSION FOR PRESIDENT KENNEDY. This story was scheduled to be published during the month of November 1963, but was pulled from the publication schedule after his assassination. It would later be published in SUPERMAN 170, which was covered back in Episode 49, December 10, 2008. He had meant for his original art for the story to be donated to the JFK Presidential Library, but recently discovered that it was up for auction. After checking with the JFK Library, which could not find any record that the art had ever been donated to the Library, Mr. Plastino tried to get the art back from Heritage Auction. According to Mr. Plastino, they informed him that he no longer had rights to the art, and would not reveal the identity of the art’s consignor. A spokesman for Heritage Auction replied to someone’s facebook post, stating that the art had first been sold at a Sothby’s auction in 1993. The consignor Heritage was working with had an excellent track record with them,, and they had no reason to doubt that he had the right to sell the art. The spokesman also explained that the picture showing Mr. Plastino holding the art for the title page was taken at the New York ComiCon. A Heritage employee was talking with Mr. Plastino, and he wanted to look at it, and another Heritage employee took the picture. If Mr. Plastino is unable to get his art back, let’s hope whoever buys the art will honor his original wishes for the original pages and donate them to the JFK Presidential Library. I covered his life and career in Episode 157 and blog. You can join the SUPERMAN FAN PODCAST group or page on facebook, and follow the podcast on twitter @supermanpodcast.SUPERMAN FAN PODCAST is a proud member of the following: – The LEAGUE OF COMIC BOOK PODCASTERS at http://www.comicbooknoise.com/league , – The SUPERMAN PODCAST NETWORK at http://supermanpodcastnetwork ! Superman Fan Podcast Episode #157: Happy Birthday, Al Plastino! Al Plastino was born on December 15, 1921 in New York City. He is best known as one of the artists on the Superman family of titles for DC Comics. Al was also the artist to a number of comic strips. To learn more about Al Plastino you can go to his own website: http://www.alplastino.com . There you can learn more about his career and view samples of his comic book art and his paintings. There is even a video interview, so you can hear his voice yourself. There is some static in the background, but otherwise the sound is fine. – ACTION COMICS 120, May 1948, publised around March 19, 1948. SUPERMAN, STUNT MAN was written by Alvin Schwartz. – ACTION COMICS 361, March 1968, published on January 30, 1968. THE POWER OF THE PARASITE was written by Jim Shooter. There is no reprint information for either story. Next Episode: The 3rd Annual Superman Christmas Story: METROPOLIS MAILBAG: SUPERMAN 64! You can join the SUPERMAN FAN PODCAST and MY PULL LIST groups on facebook, and follow both the podcast and blog on twitter @supermanpodcast. SUPERMAN FAN PODCAST is a proud member of the LEAGUE OF COMIC BOOK PODCASTERS at http://www.comicbooknoise.com/league and the COMICS PODCAST NETWORK! http://www.comicspodcasts.com/, and is now a proud member of the SUPERMAN WEBRING of websites, and is one of the founding members of the SUPERMAN PODCAST NETWORK at http://fortressofbaileytude.com/supermanpodcastnetwork !